Feeling out of place at a joyous celebration is an unsettling experience, but since then, my consciousness has been raised, not without pain, by my wife, Gretchen, and my granddaughter and namesake, Dana. However, some of the bad habits my mother drilled into me are hard to break, such as standing up when a woman enters a room, opening doors, picking up the tab, “doing nice little things,” and changing flat tires. Although she strenuously denies it, even Ann Beck at the Literacy Center sometimes looks at me as though I am an amiable antique. Other amiable antiques, commonly called heirlooms, are cool season vegetables. While tomatoes, as warm season vegetables, take extra measures to grow in Flagstaff, cool season vegetables are congenial to Flagstaff and are, serendipitously, easy to grow. 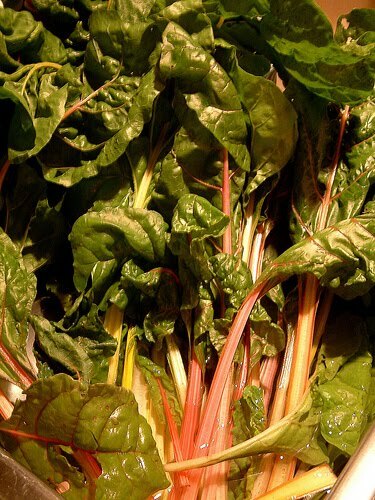 Of the beet family, Swiss chard’s a delight to the palate as well as the eye because it’s beautifully many-hued. In addition to being easy to grow, it’s wildly nutritious and a cinch to prepare. It goes well in soups, such as Above the Rim Tuscan Soup with sweet Italian sausage and cannellini beans (http://oldfartskitchen.blogspot.com. Another amiable antique, easy to grow vegetable, kale does just as well. A member of the cabbage family, it comes in many shapes and sizes, such as the Red Russian, Scottish, and Lacinato. Since Swiss chard and kale are leaves, they need a high nitrogen fertilizer as well as a soft, friable bed chocked full of compost. Both Swiss chard and kale can tolerate frost, but kale seems to thrive on it, becoming sweeter after been nipped. Snap beans are, also, antiques amiable to gardeners in Flagstaff. They come in two varieties, climbing and bush. Climbers require lattices, poles, etc. on which to climb. They supposedly taste better than bush, but bush are easier to grow and harder to pick, as in bending over. They, too, want a bed of soft, friable, compost-stuffed soil, with a 10-20-10 fertilizer. The soil should be kept moist along with regular fertilizing. Many people prefer the old regulars, such as Kentucky wonder, and while they are just as nutritious, why grow what everyone else grows. Try venturing where few have gone before with a French filet, une haricots verts. Tastier and more elegant, long and slim at 8 inches, a back friendly variety, the Maxi, offers its pods on top of the plant, rather than hidden amongst the leaves. Another slightly more exotic bean is the Beurre de Rocquencourt, an aristocrat of beans. Alas, the 8 inches pods are hidden amongst the leaves, but, true to its name, it melts like butter in the mouth. Along with the Maxi, it matures in 51 days. If these seeds are unavailable in a local commercial nursery, they can be ordered from gourmetseed.com. 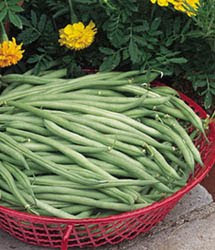 These beans are so lusciously tasty that they are best served steamed al dente with a little butter, salt, and pepper. If gilding the lily, add some crispy French fried onions or toasted slivered almonds. If gardeners want to gain a jump on our limited growing season of approximately 100 days, all of these vegetables can be started indoors on a sunny window sill using those mini-greenhouses sold in commercial nurseries.